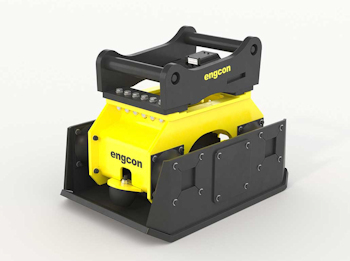 Engcon has announced that it will launch a series of entirely new low-flow compactors that can be powered by tiltrotators in 2019. According to Engcon, this will extend the area of use considerably and make excavators both more efficient and safer. Engcon has manufactured compactors for excavators since the 1990s, but the problem hitherto was their demand for such a high hydraulic flow that they could not be connected directly to the tiltrotator’s extra outlet. This meant the compactors could not be rotated freely. Engcon has solved this problem with the newly developed series of low-flow compactors. “We know that the compactor/excavator combination is ideal, as it means a major improvement in the work environment for ground workers, who must otherwise walk and control compactors down in the excavation, whose nature can vary a great deal,” says Johan Johansson, designer and project manager for Engcon’s new compactor series. Engcon is introducing three models, the PC3500, PC6000 and PC9500, where PC stands for Plate Compactor and the numerals indicate the compaction force in kg for each of the compactors. “Another major advantage when using compactors on excavators is the marked improvement in safety for ground workers. For example, when compacting in deep excavations there is a great risk that the vibrations from the compactor will cause a collapse, burying people under volumes of heavy soil,” declares Johan Johansson. In addition to the improved working environment and reduced risk of personal injury, Engcon’s compactors can be used on inclines where conventional soil compaction with rollers or hand-operated compactors is not possible. This includes everything from ordinary road embankments to compaction around bridge supports, erosion protection along watercourses and more. The new PC3500 compactor series can be seen in action at Engcon’s stand (No FM.708/3) at the Bauma 2019 exhibition in Munich, 8-14 April, 2019.